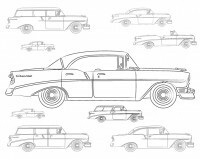 1956 Chevrolet models were a modest mid-life-cycle update to the groundbreaking 1955 Chevrolet One-Fifty, Two-Ten and Bel Air. Like its predecessor, the 1956 Chevrolet was made to appeal to a wide variety of customers; it needed to appeal to many people – the restyling cost General Motors $40 million. For 1956, engine and transmission choices were expanded, as were the choice of body styles. For the first time a 4-door hardtop was available. With a “dogleg” lower B-pillar, it was marketed as having convertible airflow with sedan comfort. It was a revolutionary model and 130,392 were sold that year.